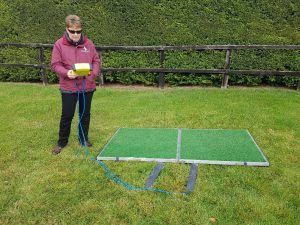 Polly Bonnor, Director of Thoroughbred Nutrition at Saracen Horse Feeds, examines the EziWeigh 7 that comes with the Goodwood. Bluetooth enables the weights to go straight to the computer or smartphone. No laborious data inputting. Each half of the platform only weighs 14.2kgs so carrying it on the shoulder, in its own bag, out to the clients’ yards is easy.